DHART crews team up with NewBrook to assist with trauma management and air transportation to area hospitals. In addition, DHART flight crews respond to public safety agency requests for medical evacuation of trauma patients from scenes of injury, and will transport to the closest Trauma Center in the region's five states. When DHART is working with NewBrook, landing space for the DHART chopper is provided by Dave and Janice Onyon. Dave, Janice and their family also provide valuable support to the landing zone crews by providing food and drinks, often on very short notice. ALS (Advanced Life Support) ambulance transport service Rescue, Inc. and NewBrook work as a team to manage and transport critically ill and trauma patients to advanced care. 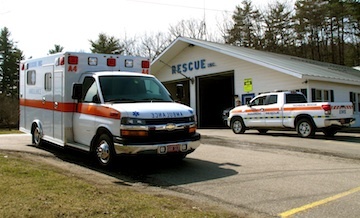 Rescue was among the first EMS agencies in the nation to offer paramedic level care and now services 12 towns in southern Vermont and 2 in Southern New Hampshire with a coverage area of 500 square miles. Like NewBrook volunteer fire and rescue crews, about half of Rescue's staff of active EMT providers donate their services to provide rescue, trauma care, and transport.